Currently offers 30 fun and challenging solitaire variations. 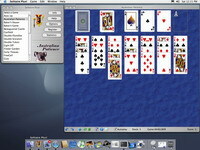 Solitaire Plus for Mac is a collection of solitaire games for Mac OS X. Several solitaire variations are provided including the Klondike, FreeCell, and Spider favorites. Spider is offered in a multi-level version: Easy, Medium, and Challenging. Solitaire Plus offers a unique smart-dragging feature that streamlines game play along with other features such as tableau spacing preferences, realistic card artwork, and more! Solitaire Plus for Mac provides large, realistic card artwork for displays with 1024x768 or higher display resolution. Solitaire Plus for Mac is designed for and looks best with large or wide-screen monitors. Solitaire Plus for Mac improves the dragging operations during game play by scanning the game window for a valid position for the card (or a pile of cards) being dragged, and then automatically moving the card if dragging is terminated before hovering over a specific pile. The smart-dragging feature is especially useful on notebooks. Most moves can be accomplished by simply nudging a card and the smart-dragging will make the move automatically. Solitaire Plus for Mac allows you to use any image on your computer as a custom card back for the deck. In addition to allowing you to use any image as a card back, Solitaire Plus for Mac supports the use of any image as a tiled background. You may also use a solid color background. Any colors you can define in the standard Apple color panel can be used. Combine your own custom card back and background image into your own personal theme while playing solitaire! There are no limits to the possible combinations. The registered version of Solitaire Plus for Mac includes more than 100 attractive background images! Solitaire Plus for Mac provides you with control over the spacing of the cards in the tableau piles. Adjust the card spacing to your own preference to view as much or little of the covered cards as you desire. Regardless of your spacing preference, Solitaire Plus for Mac will automatically adjust the card spacing to always keep all cards visible in large tableau piles. Statistics are tracked separately for each user login on your OS X computer. Solitaire Plus for Mac provides a complete on-line help system integrated with Apple's HelpViewer in both English and German languages. The rules for each game are included with a diagram of the game window layout and a glossary of terms. Help is also provided for the features and functions of the game interface. Additional support is also available via e-mail.